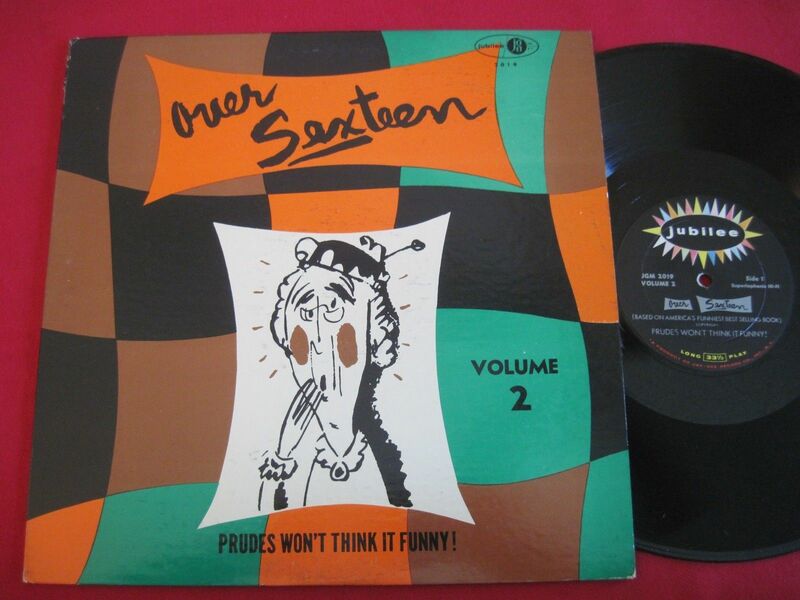 Music for Maniacs: Over Sexteen Vol. 2: Prudes Won't Think It Funny! By a very wide margin, one of our "Lowbrow" collections of mid-century sleazy-listening sounds is the most popular post of the year, and several other lowbrow posts aren't far behind. Which is great, glad to tap into something so many of you wacky cats 'n' wigged-out chicks are craving, but I'm running out of suitably vile vinyl. So I've gone record-hunting and sound-digging lately, and this time, apart from 45s (and I have found a few goodies already) and recording otherwise-unavailable songs off of old b-movies, I'm also hitting up the comedy bins for "party albums" - naughty humor sold under record counters to, er, "sophisticated" adults. A lot of them just feature lame stand-up comedy that you don't need to hear more than once, even if that, but sometimes even these records have a good musical track or two. And then there's this nutty thing, just purchased a week or so ago. Based on books of the same name, "Over Sexteen Vol. 2" stars an uncredited stentorian announcer hosting dirty jokes, acted out with enthusiasm by some uncredited actors who favor silly ethnic voices, and actresses who use a squeaky New Yoiker goil voice. All in the service of sometimes funny, but very dated humor. The audio equivalent of novelty cocktail napkins. What really makes this album, however, is the organ interludes that pop up between the jokes and skits. Sometimes the songs reference the preceding joke. The combination of all these elements add up to an inexplicable whole that is greater than the parts. I couldn't believe I was actually laughing at this corny humor as much as I was. Absolutely no information listed on the album cover, except the name 'Kermit Schafer,' the huckster who would later become very successful for his 'blooper' albums of broadcasting goof-ups. Some of those alleged mis-speaks and outtakes were bogus, recreated using actors. Perhaps the very actors featured here. Happy to see that you are still online. I grab a bunch again. Want to say a big big thank you ! You're welcome, happy to here. How do u like your new bunch? And what exactly IS the definition of "a bunch"? Hey Mr. Fabulous, Is there a way to just listen to these madcap tunes without actually downloading the entire album? We live in the country and have terrible internet speeds out here. I'm assuming most of this stuff isn't on YouTube. Please advise. Cheers! What, are you still on dial-up?! Still accessing your Angelfire site thru AOL? ;) yep, most of this stuff is not on the YouTubes. I used to sometimes use DivShare, which gave you the option of listening or downloading, but they went under. That was just for individual songs anyway, not whole albums. All those streaming sites like Soundcloud and Bandcamp are for people who actually own the rights to their own music. Random people can't put up stuff. Sites that did that, from the original MP3.com up to more recently Grooveshark, all get the plug pulled on 'em. Too bad, it is def more convenient than downloading, but the 'net Nazis spoil the fun. Jerry Blaine at Jubilee/Josie Records had a knack for adult "blue" comedy with albums like this, the Kermit Schaeffer "Blooper" collections, and the distribution of the Gross Records label during the 1960's by Doug Clark & his Hot Nuts (there were about a dozen Hot Nuts albums from 1963-1970.) And let us not forget Mr. Blaine's unforgettable rarest R&B record of all time, The Five Sharps' "Stormy Weather" from 1953 (not the 1964 issue by a totally different Five Sharps, who reportedly happened to be a white doo-wop group, as the original group were African Americans.) A unique business Jubilee/Josie was in it's prime, unfortunate to go bankrupt in 1972 and sold out to (ugh! not him again!) Morris Levy and Roulette Records. Levy set up a separate label for the Jubilee/Josie masters in 1972 (Virgo Records, distributed by Roulette y Levy and his (AHEM) "silent partners" AKA/ The Genovese Family kingpins.) One wonders if Levy ever bothered to re-issue adult humor like this album, though it was probably out-of-date by the mid 1970's. Fascinating stuff there RobGems. Mo Levy was such a thug that its hard to like him, but theres no denying his impact on music. Guess we'll never know who the voice talent and organist is on this one, eh? Doug Clark and the HotNuts! The real life Otis Day and the Knights. I know of 1 or 2 of their albums, had no idea they were so prolific. They'd be good for this blog, wouldn't they? Thanks Gonzo, but alas I do not have Vol 1. I'll buy it if/when I see a copy, I promise you that.